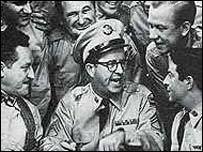 The Phil Silvers Show, starring the late actor as Sgt Bilko, has been named the top TV sitcom in the Radio Times Guide to TV Comedy. It was one of nine American shows in the top 20 list, while 11 British sitcoms made the cut. He added: "Seinfeld, second only to Bilko, was also outstanding for most of its 176 half-hours, and though the 12 episodes of Fawlty Towers were sublime, to sustain such excellence week after week, year after year, gives it the nod over John Cleese's masterpiece". The list of 20 sitcoms only includes two shows that are still being made - The Simpsons and Frasier, which is due to finish at the end of the current series. The worst sitcom of all time was named as the short-lived 1980s ITV comedy Bottle Boys, which starred Robin Askwith and David Auker as milkmen. Other sitcoms that made it into the top 20 best list include Porridge, Yes Minister, Steptoe and Son, Only Fools and Horse and the Mary Tyler Moore Show.